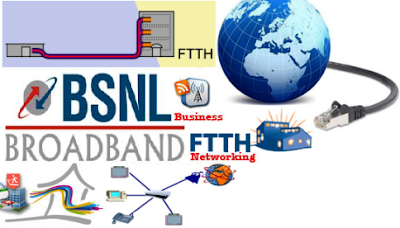 BSNL Partner with cable operators for FTTH service in India. The main telecom operator in the state, BSNL, has begun to work with local cable operators (LCO) to implement their services as broadband fiber at home (FTTH). BSNL launched its FTTH Service Warangal in partnership with OCH for the first time in Telangana. BSNL, which currently has 10,000 customers broadband in Warangal, is aiming of about 100,000 homes in Warangal. By being on the street FTTH, BSNL can provide high-speed internet and telephone services to subscribers. BSNL will replace its copper wire with optical fiber to provide a service to customers. As advertised, BSNL announced two new plans under the new FTTH system - Rs 645 for 10 Mbps with 50 GB data limit and Rs 1045 for 20 Mbps to 100 GB to improve its services by BSNL. More offices respond to customer requests in Warangal immediately. The largest telecommunications company currently has nine offices in the city. With BSNL FTTH service subscribers can get high-speed internet with the additional benefits of streaming online TV channels and other video on demand services. With FTTH service people can convert their normal LCD TV or LED TV to high-class smart TV.